Our first fire of the season started this past weekend. 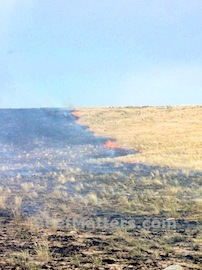 A dry lightening storm passed through on Saturday and one of the strikes started this fire. A fire was inevitable this year. It is so dry and there is so much fuel (grass) out there. I have many friends in Colorado and we have talked about the devastating fires in their state. 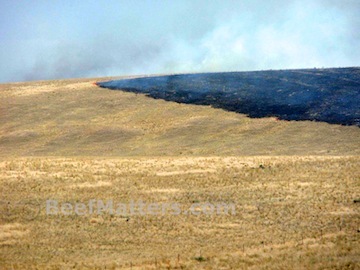 Remembering the large fire here in Idaho several years ago, I knew how frustrated they felt. Each conversation with my Colorado friends reminded me that it was only a matter of time until we were battling another large fire here in Idaho. 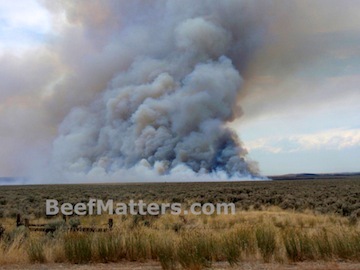 The BLM has sent a Type II fire team to combat this fire. Everyone is hopeful that this increase in manpower will improve the chances of containing this fire in the very near future. 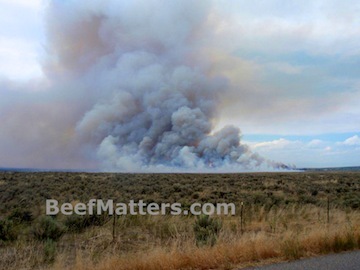 Currently, the BLM estimates that this fire has burned over 80,000 acres. We are all praying for cooler temperatures tonight and for the winds to die down, so the fire crews can get ahead of this fire. There are cowboys, neighbors, family and friends out on the desert right now trying to stop this fire. The entire community pulls together and does everything they can to help. When you watch the grass you were going to feed your cattle this fall and winter burning up and your summer range is in a drought, one of the few comforts is knowing that you are part of a strong community. Thinking of you….as, I remember a quick trip home several years ago for the same reason!!!! Be safe!